At the opening of the movie Jerry Maguire, sports agent Jerry has an "epiphany" about his job that results in him writing what is known as a "Mission Statement". His Mission Statement is a true reflection of what he believes, and it contains his personal goals. However, for every fantastically written and sincere Mission Statement (often coupled with its twisted sister the "Vision Statement"), there are 15 awful and meaningless ones. We've all seen the cheesy office Mission Statement that's either tucked inside or next to a motivational poster. It's long-winded, full of whatever current "buzz" words are popular, and easily forgettable. Hartnell University welcomes what our students bring to the table and promises to make the classroom a positive, supportive, respectful, and safe environment. We strive to provide all students with a daily dose of high-intensity, full-contact learning! Hartnell University promises to flip history on its head and examine it from every possible angle, taking our students on one crazy ride like no other teacher has ever done before! 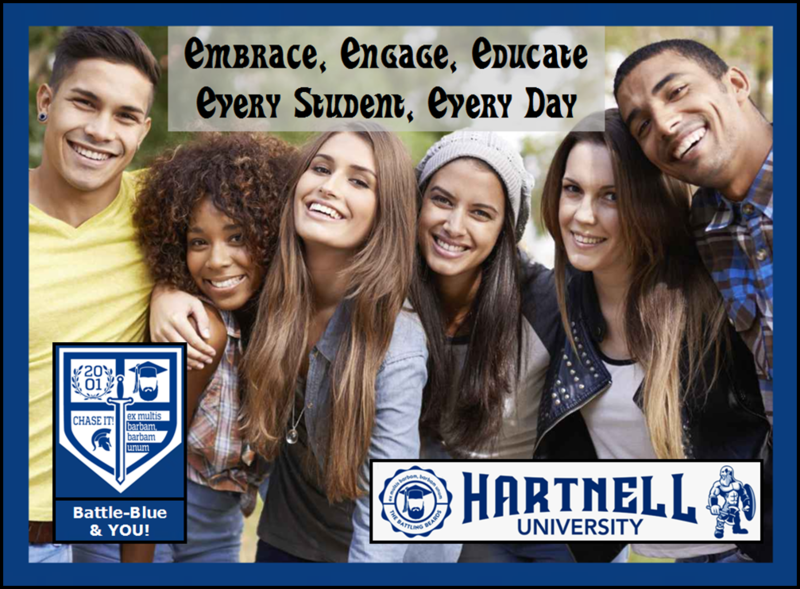 Hartnell University believes that education is crucial to creating a solid foundation from which all students can begin their "chase". Hartnell University's educational philosophy puts students "front-and-center" and in the ideal position to learn and grow. Under our tutelage, every student can be successful. Hartnell University promises to give our students our absolute best every day. The moment they walk through our doors, students know our classes are 45-minute safe-havens from "life" and a chance for them to truly shine.